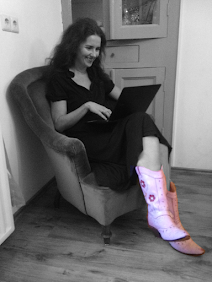 When I first put my Miracle Custom Molding Insoles in my boots, I knew that it was good. Because my inner discjockey started playing songs like: 'I'm walking on sunshine, ohoh!' and 'I believe I can fly'. They made me feel lightfooted and lightweight! And the soles themselves are light too. The idea behind these insoles from Profoot is that they mold exactly to the shape of your feet, thanks to the layer of advanced Vita-Foam MT. By doing that they create a custom fit to any pair of shoes. The bottom layer supports your feet by lifting the arch and stabilizing your heel, and is shock absorbant. It only takes these insoles 2 hours to learn the shape of your foot and adjust accordingly. I like quick learners! 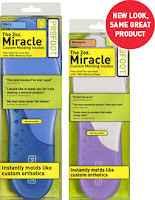 So I'm very happy to report Profoot has kindly offered two pairs of these insoles for me to give to you! To participate in this giveaway answer the question in the form below! And if you want to improve your chances of winning, just put a link to Mom's Home Run in the linklist on your blog, and then leave a comment telling me you did. Tip: visit Profootcare on Facebook! I'm sure you'll like it! Hey there...thanks for visiting my blog...i'm a new follower!!! Thanks for adding the giveaway!!! It's much appreciated.